One sunset seen from the sweeping decks of Vista Caribe and you’ll be head over heels. 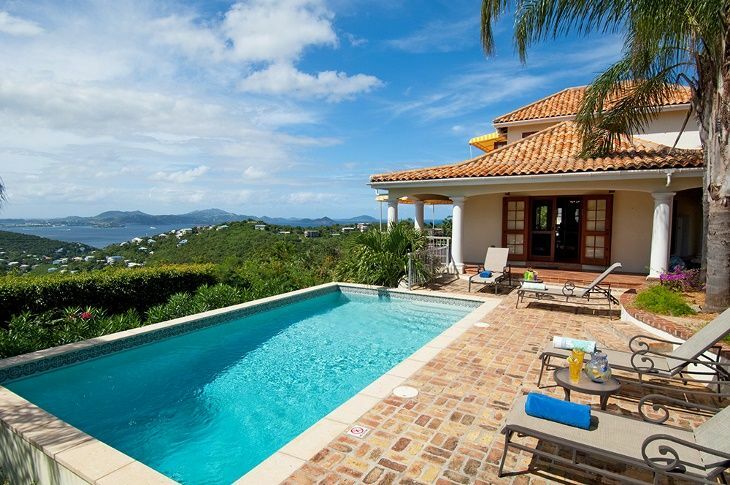 This luxurious island home is the ideal choice if you’re a fan of privacy, comfort, and incomparable Caribbean vistas. In addition to a beautifully appointed great room, expansive modern kitchen, and a laundry list of modern amenities, the villa offers a stunning pool area and an array of plush outdoor living spaces. Three richly furnished bedroom suites are attached to the main house, and a fourth sits detached and includes a kitchenette and seating area. Vista Caribe is nestled high above Great Cruz Bay in the Virgin Grand Estates, a prestigious residential enclave envied for its gorgeous island breezes and its convenient central location. Just a few minutes of driving and you’ll be enjoying the laid-back bustle of Cruz Bay or the breathtakingly beautiful North Shore beaches. The house was amazing! View was spectacular! The house was very well equipped with essentials - the kitchen was pretty well stocked. We would absolutely stay again! All rates are based upon number of guests. Rates quoted on HomeAway are for the maximum number of guests. Smaller groups will receive an adjustment to their rate. Weekly Rates: High Season 2 persons: $6,000 4 persons: $6,500 6 persons: $7,000 8 persons: $7,500 Low Season 2 persons: $4,500 4 persons: $5,000 6 persons: $5,500 8 persons: $6,000 Thanksgiving: $6,500 Christmas/ New Year’s: $9,000 Additional charges include 12.5% VI Room tax, non-refundable $50 Security Deposit Waiver Fee and $50 Reservation Fee.